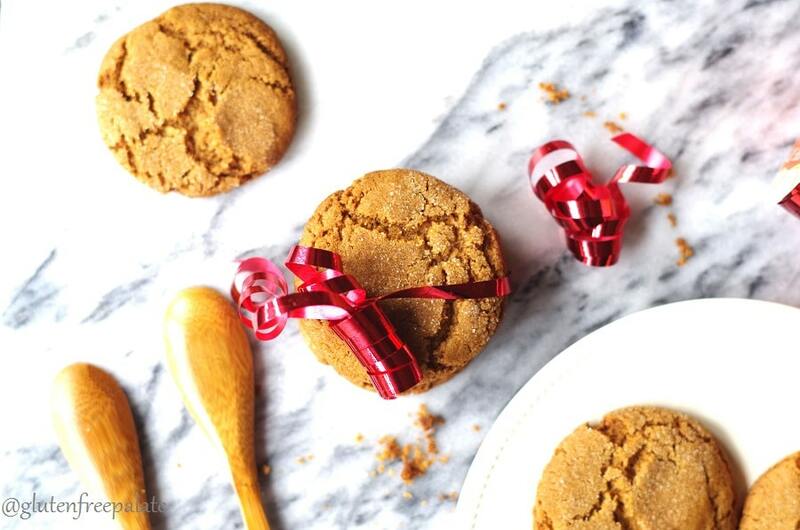 Perfectly spicy, and not too sweet, these Gluten-Free Gingersnaps can be enjoyed for dessert or an afternoon tea. They are bursting with flavor and are perfectly crunchy which makes them a good cookie for dunking. Gingersnaps are a hard ginger cookie that traditionally make a snapping sound when broken in half. 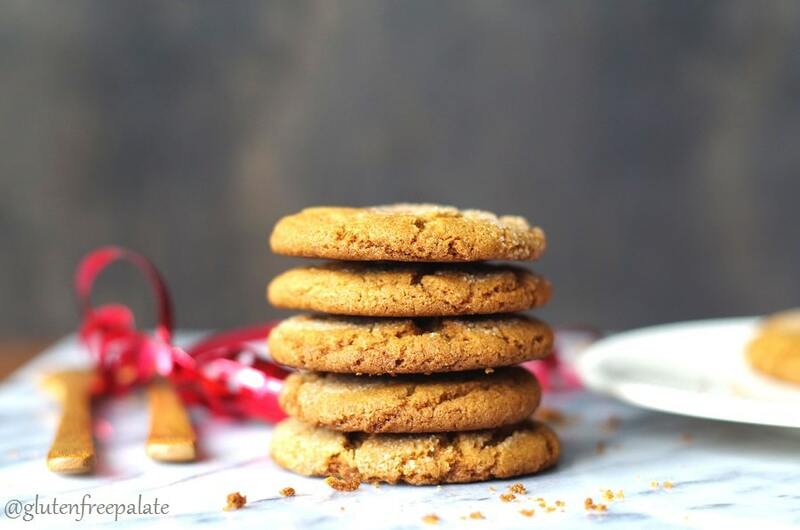 Gingersnap cookies were invented hundreds of years ago in Europe and America and were a crispy or crunchy cookie that used molasses to sweeten it. 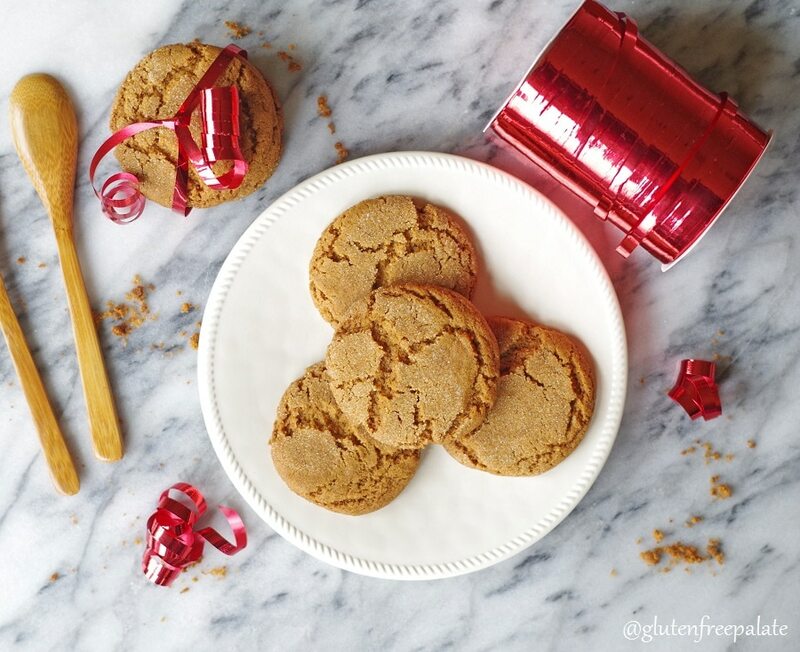 Making gluten-free gingersnaps is simple and uses minimal ingredients. I like to keep most of my recipes to ten ingredients or less to keep it simple in the kitchen. When our ancestors invented things like cookies and cakes they didn’t have several ingredients to choose from. They had simple ingredients like flour, milk, butter, eggs, and sometimes (later in history though) sugar. Spices came much later and are very appreciated in baking these days. After the gingersnap was invented, several other types of ginger cookies started making there debut in kitchens. Recipes for ginger chews (a softer, chewy cookie), gingerbread (a combination of chewy and firm), and ginger molasses cookies (soft, chewy and bold in flavor) can now be found by the hundreds on the internet. While my family is a fan of all types of ginger cookies, gingersnaps remain a favorite. They last several days in an airtight container, can be dressed up with icing if desired, and are perfect for dunking in coffee and tea (I’ve said this twice now, so you can guess how I enjoy my gingersnaps). 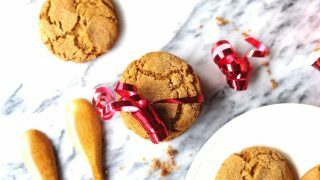 You won’t miss the gluten in these gluten-free gingersnaps as they are perfectly crunchy, hold well dipped in milk or tea, and have a pleasing crumbly texture. No binding agents required and they won’t fall apart when you remove them from your baking pan. They are simple to make and the dough freezes extremely well. 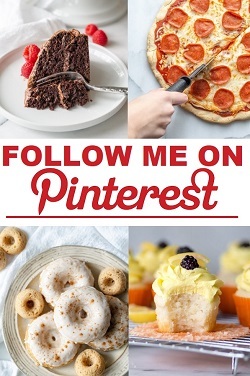 Looking for more cookie classics? You’re going to love my Gluten-Free Double Chocolate Cookies and my Gluten-Free White Chocolate Macadamia Cookies. Preheat oven to 350°F (180°C). Position the oven rack in center of oven. Line two cookie sheets with parchment paper; set aside. In a large mixing bowl, cream shortening, sugar, egg and molasses. In a separate medium mixing bowl, combine flour, baking soda, ginger, cinnamon and salt. Gradually add flour mixture to the wet mixture until combined. Roll the dough into teaspoon-size balls. Dip one side of the dough balls into sugar and place sugar side up onto the cookie sheet two inches apart. Bake for 12–14 minutes (one pan at a time) or until lightly brown and starting to crack. Let cool on the pan for 5 minutes. Carefully transfer the parchment paper with cookies to a wire rack and cool. Store in an airtight container. These are beautiful cookies! Alas I am allergic to most granulated sugars/substitutes, so I grind up dried dates to make a brown sugar simulacra. Perhaps because of this substitution they didn’t flatten as in your photographs, nonetheless I have tender, delicious cookies. It is easy enough to flatten them pre-baking next time. I love that they are not too sweet and that they are nicely spiced. Thank you so much for stopping by! You don’t have to make your cookies flat 🙂 Not all gingersnaps are flat. It sounds like you found a lovely substitution for the sugar. What if I don’t have Ryze flour (and no time to get it). 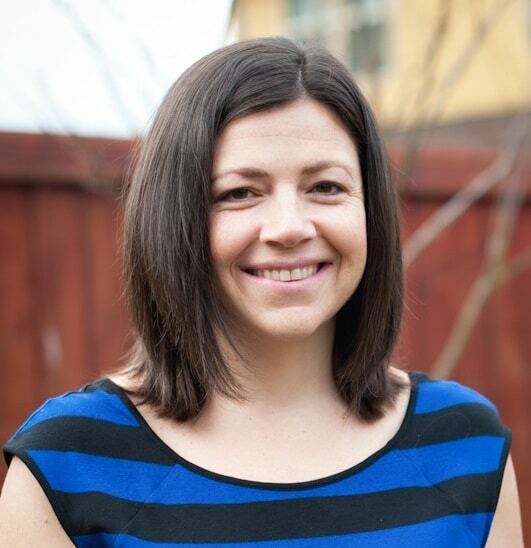 Will another cup-for-cup gluten free flour substitute work? Should I use one that is xanthan gum free? 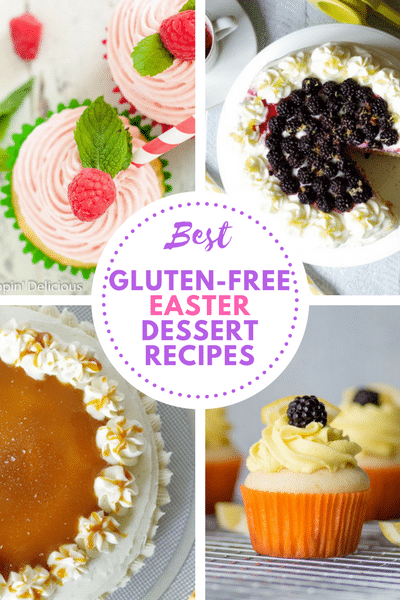 You can use another gluten-free flour blend. You don’t need to use xanthan gum in this recipe, but it won’t hurt it if the blend you have uses xanthan gum. In this recipe, it might make the cookies a little harder, but they will still be delicious. Hi Chrystal, I’m curious what shortening you used. I used Nutiva and the cookies flattened much more than the ones in your photo. Also, the recipe made more like 5 dozen! I haven’t uses Nutiva (or other coconut/palm shortening in this recipe, I have in other recipes). I usually use an organic vegetable shortening, or crisco in these cookies. The flour blend I used in this recipe is Ryze. The rice flour tends to absorb more of the moisture/liquid. Can I ask what flour blend you used? Sorry to hear they were flatter. Did they still have a pleasant texture? Thanks for your reply! I used a mix of Namaste and Pamela’s flour. The cookies came out very crunchy and were popular at the events where I served them, but not what I was hoping for. I’ll try again with a different shortening. Thanks! I would guess it’s the flour blend, not the shortening. I haven’t tested those flours in this recipe, and honestly I haven’t had a good experience with Namaste flour. Different people prefer different flour blends – the blends I have used in this recipe are Ryze and Bob’s Red Mill 1-to-1 gluten-free flour blend. I am allergic to certain types of sugars, includingo those in wheat products. I’ve been using oat flour as a substitute. Would that work in this recipe, or should I use a rice flour blend? Sorry for the late reply, I was out of town. I haven’t tried oat flour in this recipe, so I am not sure how it would work out. I like to use Ryze rice flour. If you can’t find Ryze, I bet you could do half oat flour and half rice flour in this recipe.